Enjoy life in this adorable yacht. 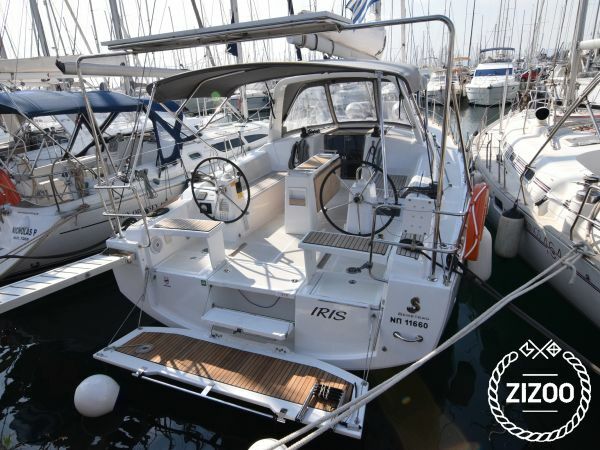 Built in 2017 by Beneteau, Iris cleverly combines practical features, performance, and elegance. Her onboard spaces can accommodate a range of guests, from families to couples or group of people. A key feature is her big master cabin with two big hull portholes that gives you perfect surrounding view. With internal layout of 3 cabins and 2 toilets this yacht provides excellent and comfortable onboard living for 6 guests. The special hull design offers high speed when sailing and her twin rudders gives excellent control of the yacht. In the ports, her powerful bow-thruster makes the yacht more than easy to maneuver. A large retractable swimming platform in the aft of the yacht is another major feature where you will spend most of your time while swimming and enjoying the sunset of Greece.